Are we human beings living at the present time the first to contemplate the beginning of the universe in its true aspects? Or did any ancient people have the same vision? Many ancient peoples projected their own image large on the heavens to explain natural processes. The ancient Egyptians had this pictorial cosmology. 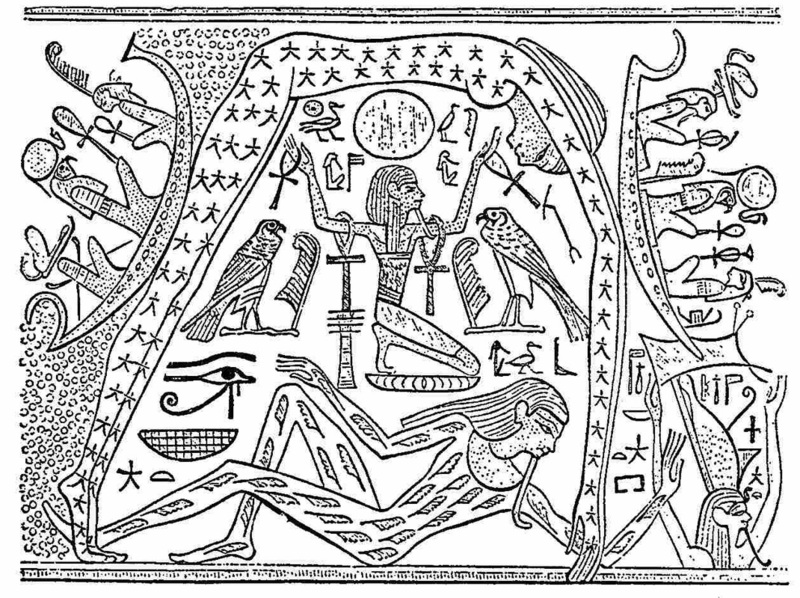 The Earth, “Geb”, is a recumbent god wearing a suit decorated with sheaves of grain. “Nut” is the sky. Nut never seems to tire of making an arch of her body over Geb and “Shu,” the air. The Sun is the god “Ra” (or Re), supreme in the pantheon of the Egyptians. Ra’s ship rises in the twilight behind Nut’s legs and then glides down her arms to the place of the dead. The Sun rode in a chariot through the skies. The god who drove the Sun’s horses usually was reliable, but sometimes eclipses occurred when a reckless driver took the reins. Or there was a Prime Mover who pushed the outermost sphere of the stars. His efforts, transmitted through a system of gears or rollers, also drove the inner, transparent spheres that carried the Sun, Moon, and planets. Every mysterious phenomenon had a god or goddess in charge. Motherly goddesses made women, livestock, and soil fertile. There were surly, touchy gods that would shoot off volcanoes or send plagues if people failed to appease them with sacrifices. Frequently people suffered merely because the gods were squabbling among themselves. The chief of the gods needed a consort to keep him from being lonely and perhaps eccentric. Even so, he might spy a beautiful woman and take on some earthly form to go after her, provoking his consort goddess to jealousy and harmful revenge. Ancient peoples had various insights into the workings of the universe. For centuries great minds have asked why the Earth does not fall. What keeps the Earth from falling? Some versions of Hindu mythology present this fanciful cosmology. Here the Earth rests on the backs of four huge elephants. 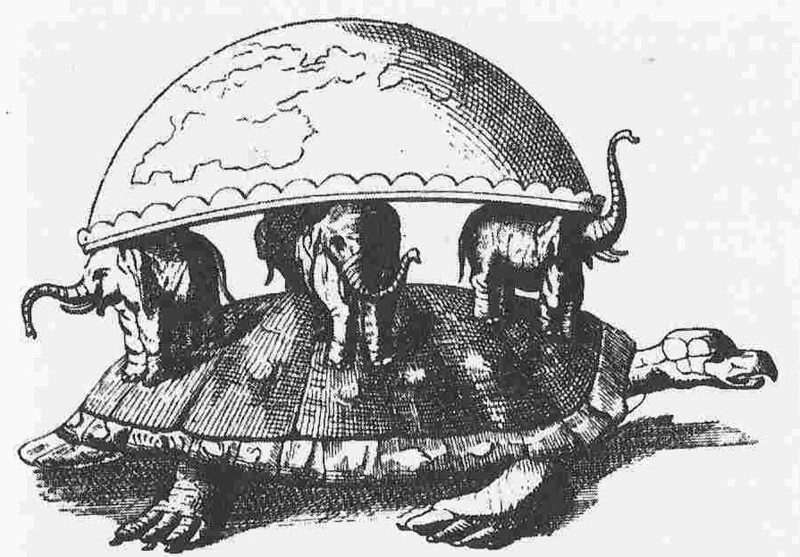 The elephants do not fall because they are standing on the shell of an even larger turtle. But what supports the turtle? Most myths require another Earth under everything to support the sea or man or god or turtle or elephant that upholds the world. Modern wags say “It’s turtles all the way down.” This illustrates the problem of regression in philosophy. After imagination is exhausted, one must repeat one of the earlier explanations. Even Einstein worked on an extension of the problem. He studied why the skies do not fall, that is, why the galaxies have not come together in one great clump. It is worthwhile reviewing the ancient cosmologies just to make sure our modern account addresses the questions people have always asked. At the same time we should be aware of the deficiencies. Almost all the ancient cosmologies suffered from the same problem. The gods, goddesses, and mythical giant animals needed a super universe in which to live. “Nut,” the Egyptian goddess of the heavens, “Geb” the Earth, and the Hindus’ giant turtle all rested on some foundation beneath the Earth. Who or what provided the super universe, the foundation beneath the Earth, and the gods or goddesses or other superior beings that lived and formed the universe we know? Was there one supreme god, uncreated, pre-existing, without needs of his own, the one who made everything else?